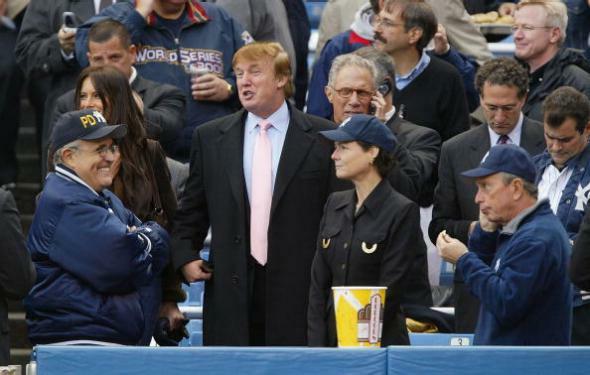 Rudy Giuliani, Donald Trump, and Michael Bloomberg at a Yankees playoff game on Oct. 15, 2003. When news started to float around in January that Michael Bloomberg was considering a third-party run for president, Slate’s Jamelle Bouie was concerned. In a three-way race, it’s unlikely any candidate would win a majority of electoral votes, and then the power to choose the president would be taken out of the hands of the American people and thrown to Congress. The fact is, even if I were to receive the most popular votes and the most electoral votes, victory would be highly unlikely, because most members of Congress would vote for their party’s nominee. Party loyalists in Congress—not the American people or the Electoral College—would determine the next president. As the race stands now, with Republicans in charge of both Houses, there is a good chance that my candidacy could lead to the election of Donald Trump or Senator Ted Cruz. While the former New York mayor writes that he is “not ready to endorse any candidate,” his move is obviously good news for Hillary Clinton, who loses the popular vote to Trump in some polls of a prospective Trump-Bloomberg-Clinton race but generally beats Trump when the hypothetical matchup is head-to-head.